Imagine the richness of French press coffee combined with the convenience of an insulated coffee container, and you’ll understand the revolutionary idea behind Brewfish. 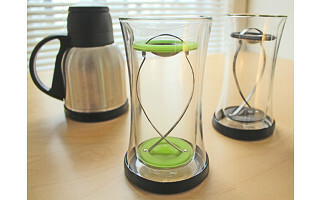 It’s both a coffee maker and a drinking mug that can keep your coffee (or tea) hot for hours. Brewfish gets its name from its filtering system, which is shaped like a fish and has two silicone disks. The bottom disk ("GoodSeal"), which does the pressing, has a stainless-steel mesh filter so you can brew with fine grind coffee or loose teas. The top disk, which is hinged, seals the container and traps in the heat if you keep it flat/closed. If you tilt it slightly, you can drink or pour from the Brewfish. The brewing/serving combo is the brainchild of Gary Ross, who has been designing innovative coffee and tea gadgets since he founded housewares company Highwave in 1982. (Coffee lovers swear by Highwave’s MoJOEmo, a leak-proof stainless steel thermos mug that keeps hot drinks hot and cold drinks cold for up to eight hours.) The Brewfish container is made from double-walled borosilicate glass, which is superb for retaining heat, and has a non-slip silicone base. You can choose your own coffee or tea, control the brewing intensity, and take the Brewfish to work, running errands, or around town. Finally, a coffee maker that multitasks as well as you do! speaking with you today concerning three of our great products. product. For example, we were the first company to introduce a travel mug for a car. in a car when driving. only product on the market that allows you to use even fine, medium or coarse coffee grounds. The non skid silicone base allows you to put the item on any surface. product can be put in the microwave to heat up the water as well. not have to worry about leaking. Take it to work, the ball game, swim meet or even ice fishing. You will love your MoJOEmo. and will allow you to make, drink or carry great coffee or tea everytime. How do you use it if you use cream/sugar? @ Dion - Put the hot water in. Add the coffee. Then put in cream and sugar or both. Let the coffee brew and then press the filter down. @ Dion - In my sequence below, I should have noted that the coffee should brew before you add the cream or sugar. After the coffee brews, lift up the filter and then add the cream or sugar. Then, press the filter down for the perfect cup of coffee. What is the difference between the tea and coffee versions? @ Laura - The coffee and tea presses function the same. The only difference is the color. In a home where you have a coffee drinker and a tea drinker, the color difference allows you to keep the unit specific to the drink of choice. can you put all the parts in the dishwasher? @ Debbie On the presses, both the glass and the filter are top shelf dishwasher safe. The MoJOEmo is a hand wash item. What parts of the press are plastic? More specifically, do any plastic parts come into contact with the coffee or tea with this press pot? @ Ajax: The filtering system, which is shaped like a fish, has two food safe silicone disks. 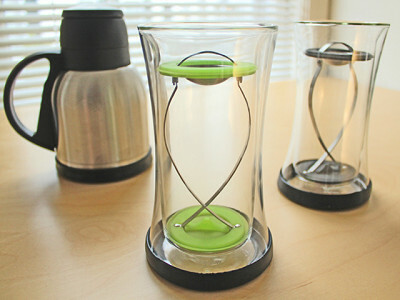 The bottom silicone disk ("GoodSeal"), which does the pressing, does come into contact with the coffee or tea. Thank you for your interest. Does the MoJOEmo have any plastic parts that come in contact with the beverage, or is it silicone? @Tamara: Good question. I have a message in to David and will let you know. @Tamara: The body is 100% stainless steel. There are two gaskets in the bottom part of the lid that come in contact with the beverage & are made of food safe silicone. The bottom part of the lid could also comes in contact with the beverage. This is also a food safe plastic. Thank you for your interest. Where is the press and the MojOEmo Made. @Roseann Ciesla: Made in China. Is the moJOEmo a press also, or just a mug? @ Ray: The MoJOEmo is a thermal mug that has a 360 degree drinking lip that is also leakproof. Keeps drinks hot or cold for up to 8 hours. 22 oz with silicone base. Imagine the richness of French press coffee combined with the convenience of an insulated coffee container, and you’ll understand the revolutionary idea behind Brewfish. It’s both a coffee maker and a drinking mug that can keep your coffee (or tea) hot for hours. Brewfish gets its name from its filtering system, which is shaped like a fish and has two silicone disks. The bottom disk ("GoodSeal"), which does the pressing, has a stainless-steel mesh filter so you can brew with fine grind coffee or loose teas. The top disk, which is hinged, seals the container and traps in the heat if you keep it flat/closed. If you tilt it slightly, you can drink or pour from the Brewfish. The brewing/serving combo is the brainchild of Gary Ross, who has been designing innovative coffee and tea gadgets since he founded housewares company Highwave in 1982. (Coffee lovers swear by Highwave’s MoJOEmo, a leak-proof stainless steel thermos mug that keeps hot drinks hot and cold drinks cold for up to eight hours.) The Brewfish container is made from double-walled borosilicate glass, which is superb for retaining heat, and has a non-slip silicone base.